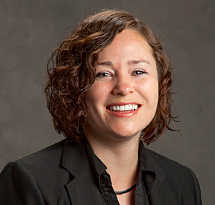 Megan Moore’s interdisciplinary research agenda is focused on health equity and improving social work practice, and health and mental health outcomes for patients after traumatic injury. She is working to 1) address disparities in care and service access, and 2) develop interventions to improve psychosocial care, communication, and care transitions in healthcare settings. She investigates methods to enhance the role and skills of social workers embedded in medical treatment teams in order to achieve these aims. She centers her research in the public health system, and in particular in the Emergency Department, because of its function as a critical intervention point and safety net for medically underserved and vulnerable populations. While focused on social work delivered interventions, her research is multidisciplinary in nature. She collaborates with medical professionals and researchers from diverse disciplines including emergency medicine, neurosurgery, nursing, and psychiatry. Her research is conducted at the hospital and in the community because of her commitment to develop clinical interventions that translate effectively. Her research has been featured in a number of publications including the US News and World Report and UW Institute for Translational Health Sciences News. Dr. Moore received her master’s in social work and doctorate from the University of California, Berkeley. She became a licensed clinical social worker in 2011. Her practice experience has been in public health settings, including the emergency department, inpatient hospital and outpatient mental health clinic; she has worked as a medical and psychiatric social worker, trauma therapist, grief counselor and case manager. She specialized in providing services to persons with traumatic brain injury and their families and observed the devastating effects of traumatic brain injury on patients’ daily functioning, psychological well-being and family relationships. After recognizing the limitations of available psychosocial treatments, she became passionate about contributing to an evidence base for practice with this population. These experiences inspired her current research program and her commitment to training future social workers in effective and integrated intervention strategies. Dr. Moore joined the School of Social Work faculty in 2012. She is Core Faculty at the Harborview Injury Prevention and Research Center and a faculty affiliate at The Mack Center on Mental Health and Social Conflict at the University of California, Berkeley, a member of the Society for Social Work and Research and the National Association of Social Workers.